License Plate Bolts (pair), misc. 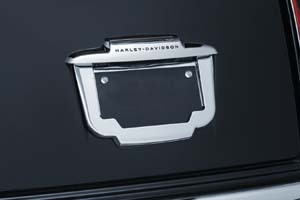 LP-48: Offers full coverage of the license plate with a clean design styled to complement Tri Glide trunks. Utilizes factory plate illumination and features durable aluminum construction with foam backing to eliminate rattling and scratching the trunk surface. Chrome. Fitment: '11 - current FLHTCUTG Tri-Glide Ultra Classics & '10 = '11 FLHXXX Street Glide Trikes. LP-49: Similar to above but in black. GFTR-1: A weather resistant storage box that mounts between the motorcycle and the license plate. It is ideally suited to storing the vehicle registration and other small objects while remaining unobtrusive. The GFTR-1 has features that provide benefits over other motorcycle storage devices i.e., low cost, concealed mounting location, vehicle styling is unaffected, and easy accessibility. 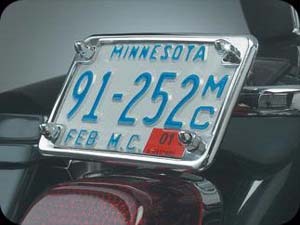 The GFTR-1 is sized to work with all standard size license plates but will also work with the current Wisconsin and Ohio cycle plates on most motorcycles. (External Dimensions: 7"l x 4"w x 1”t; plus 1" on the width for the lock. Internal Storage Dimensions: 6.3"l x 2.2"w x 0.8"t.) Made from molded polypropylene. 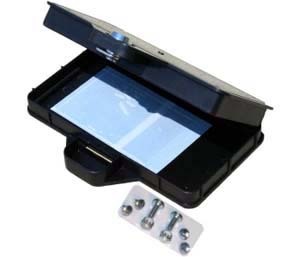 Includes all mounting hardware, retention pouch for paper documents, lock and two keys. Now also includes foam insert. 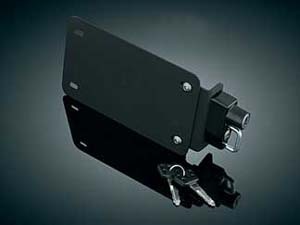 L48: Add this license plate helmet lock and conveniently lock your helmet to your motorcycle. 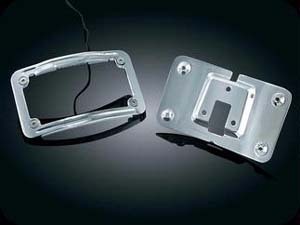 The simple little mounting plate easily bolts to the back of almost any motorcycle and allows the easiest access for locking your helmet. Great when your tour-pac is full while on tour! 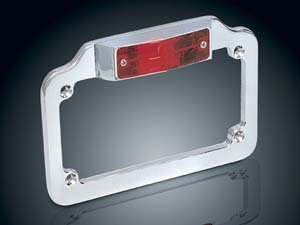 9167: This chrome die-cast license plate frame incorporates two high intensity light bulbs that are wired separately. 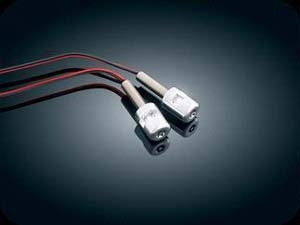 Wire one each to your brake and tail lamp circuits or together for an extra bright stop or running light. Fits 4" x 7" plates. 3151: You asked for it - we designed it! 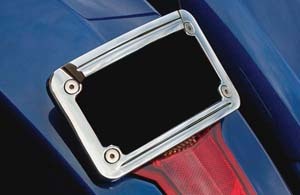 This very classy curved license plate mount hugs the contour of the fender and replaces the existing fender tip. 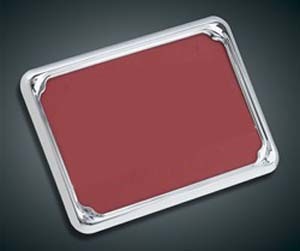 This base plate design incorporates a stylized tip, red L.E.D. lights and a light to illuminate the plate itself while cleaning up the clutter on the rear fender. 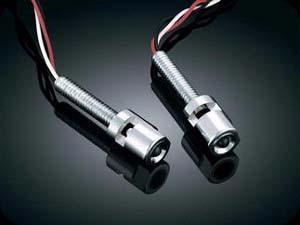 A simplified wiring solution readily plugs in on '96-'08 Touring Models and '96-'13 Softails. Hardwiring is required on earlier models. 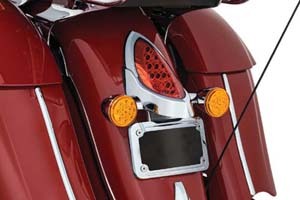 Replaces Stock Fender Tip Light on ’80-’08 Electra Glides, Tour Glides & Road Kings, ’98-’03 Road Glides, & ’86-’13 FLST Models. 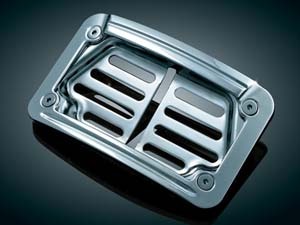 9182: Universal design for custom or stock fenders. Includes chrome backing plate and outer frame with built-in LEDs to illuminate license plate and hardware/ Accepts 4″ x 7″ license plates. 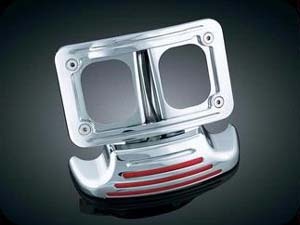 9166: Our chrome frame & back plate will dress up your license plate when using the stock bracket. Fits 4" x 7" plates. 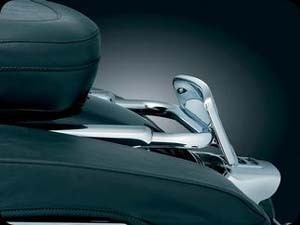 113: Here's an easy way to give your Road King or Road Glide a sleeker look. This license plate bracket lays down to complement the lines of the fender rather than standing up like a billboard. Mounts in the same location as the stock piece. Easy to install. Fits: '97-'08 Road Kings (ex. '07-'08 FLHRSE), '98-'08 Road Glide & '97-'08 FLHT Standard. 9163: Small. The one thing most custom license plate frames have in common is they are too small to fit about half of the state's license plates! This frame is offered in two sizes to fits 4" x 7" plates. Depending on which plate you're working with, some minor modifications may still be necessary, but this will make many installations much easier. This great looking frame is finished in glistening chrome, & has ball-milled accents. 9164: Large. Same as above but for larger 4-3/8" x 8". 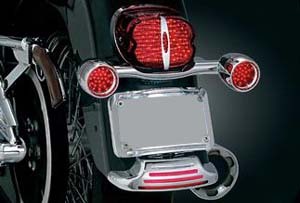 4247: Mount auxiliary marker lights or turn signals to your license plate & open up that saddlebag area or just streamline your rear fender. 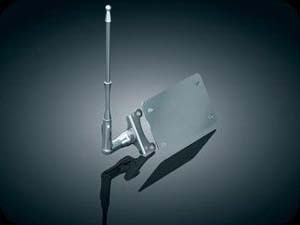 This simple system mounts directly to the back of your license plate with support backing plate & two side mount brackets. 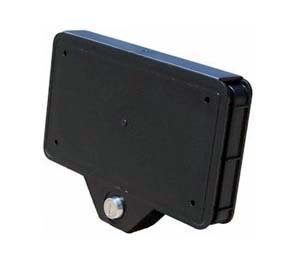 The side mount brackets have a 3/8" hole & will accept Lights (sold separately). 3160: Show your American pride with this beauty! 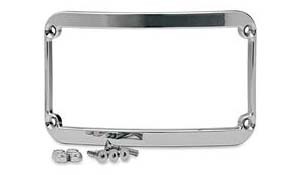 This universal plate frame features a chrome-plated ABS outer frame & chrome-plated steel backing plate. 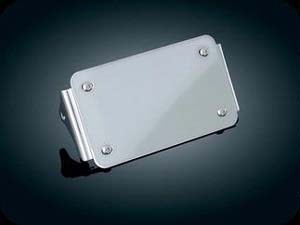 The backing plate is drilled for universal mounting or it can be mounted in place of the stock license plate bracket on '97-'08 Road Kings (except '07-'08 FLHRSE), '98-'08 Road Glides, or '97-'08 FLHT. Fits: 4"x 7" Plates. 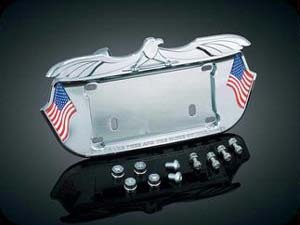 3161: This contemporary eagle license plate frame can be the final touch you need. The frame is chrome-plated ABS & backing plate is chrome-plated steel. 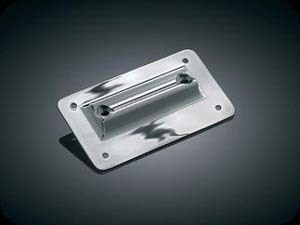 The backing plate is drilled for universal mounting or it can be mounted in place of the stock license plate bracket on '97-'08 Road Kings(except '07-'08 FLHRSE), '98-'08 Road Glides, or '97-'08 FLHT Standards. Fits: 4"x 7" Plates. 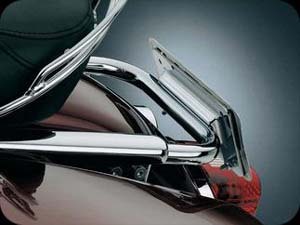 E4256: Euro License Plate Trim for France was built using durable chromed ABS for a long lasting high luster. 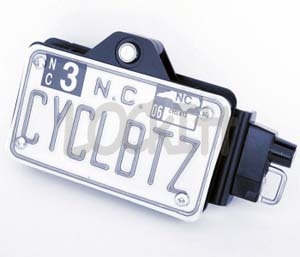 Fits standard 142 mm x 213 mm motorcycle plates. 248: Premium show chrome curved license plate frame. 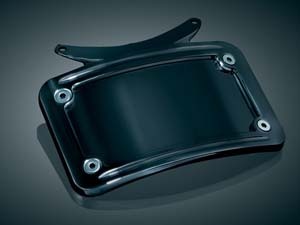 Perfect for custom application or our Fender w/Filler Panels. 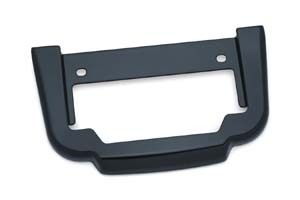 3143: Gloss Black curved license plate frame. Fits: '91-'13 Electra Glides, Tour Glides, '94-'14 Road Kings; '98-'08 Road Glides, '06-'09 Street Glides & '86-'14 FLST/C/N. 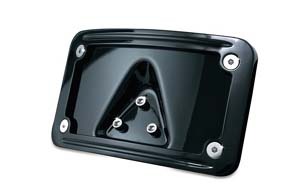 3149: Gloss Black Curved License Plate Frame (ea) Fits: '06-’09 Street Glides, '09-Road Glides, ‘09 Electra Glide Standards, ‘09-’14 FLHR Road King, ‘07-’08 FLHRSE, ‘05 FLHTCSE & '12-'14 Dyna Switchback. 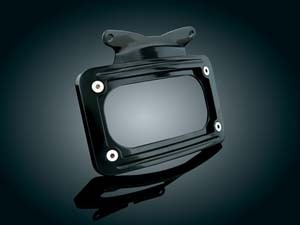 3147: Gloss Black Curved License Plate Frame (ea) Fits: ‘10-'14 Street Glides (except '10-'12 FLHXSE) & Road GlideCustoms (except '12-'13 FLTRXSE). 3157: Curved License Plate Frame (ea). Fits: ‘10-'14 Street Glides (except '10-'12). 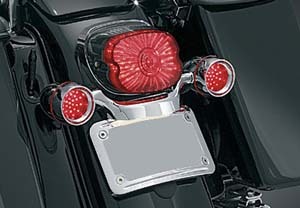 3163: The Street Glide is way cool, but this bolt on, gracefully curved license plate mount makes a big difference. Rid yourself of the stock black bracket and the flat look. No drilling - no need for new license plate light. Just bolt it on and go! 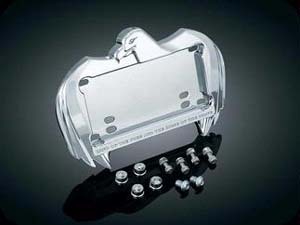 Fits: '06-’09 Street Glides, '09-Road Glides, ‘09 Electra Glide Standards, ‘09-’14 FLHR Road King, ‘07-’08 FLHRSE, ‘05 FLHTCSE & '12-'14 Dyna Switchback. 3165: As long as you have to display a license plate on your bike, why not make it look like it belongs there? Curved to your fender's contour and laid down for a sleek low profile, this chromed, ball milled mount will blend in, not stick out. Designed to fit 4"x7" plates. Fits: '97-'08 Road King (ex. '07-'08 FLHRSE), '98-'08 Road Glide, & '97-'08 FLHT Standard. 7688: Nobody likes to have a license plate, but we all have to have one. So here is the solution to make it look good, maintain functionality, & remain legal all on a simple bolt on package. This curved plate frame features L.E.D. backlighting & a 15 degree mounting angle that flows with the lines on your bikes rear fender. Fits: Victory: '10-'13 Cross Roads & Cross Country Models Universal: Bolts to flat plate mount (Widest mounting slot is 5" wide) for 4"x7" plate. 5699: The L.E.D. 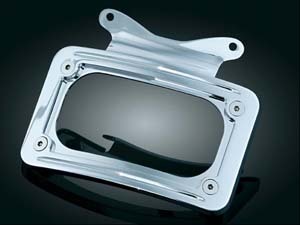 Curved License Plate Frame with Mount creates an instant style upgrade for Indian Roadmaster, Chieftain and Chief models. This die-cast aluminum frame is a direct replacement that hugs the rear fender and complements surrounding OEM chrome accents, with built-in L.E.D. 's that illuminate the license plate. Fits Aall '14-'16 Indian Chief Classic, Dark Horse, Vintage, Chieftain & Roadmaster Models (except Scout). 3148: The rear fenders on today’s Cruisers are very impressive. The license plate bracket & reflectors are a different story. 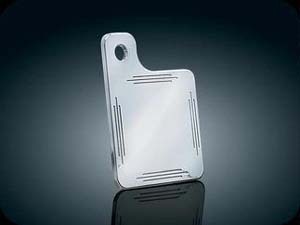 Our streamlined License Plate Mount holds a 4" x 7” plate & is truly the final touch needed. Such a difference for so little money. 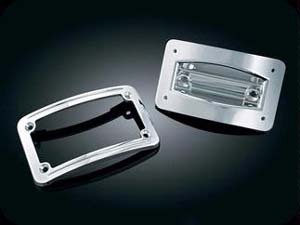 Fits H-D® Model with Standard 3-Bolt Mounted License Plate Bracket & Universal for Custom Applications. Black. 9171: Same as above but in chrome. 4249: Show your patriotism by adding this American flag to the license plate of almost any motorcycle. 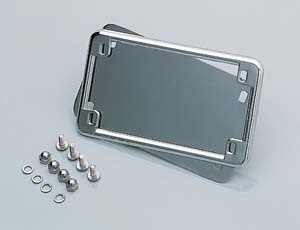 The mount bracket & support plate bolt in behind the license plate quickly & easily. The angle of the 12" staff can be adjusted without tools. Includes a 4-1/2" x 8-1/2" American flag.Universal application. 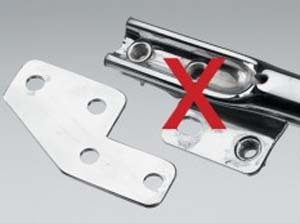 Be sure motorcycle's license plate mount is sturdy enough to support force applied by flag at speed. Note: Will not install with Curved License Plate Frames or Swept/Lone Eagle License Plate Frames. 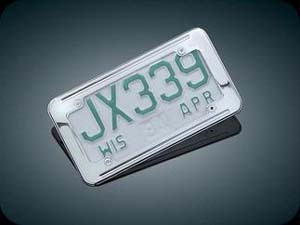 9199: Light up your license plate whether it's in the stock location or custom mounted with these white L.E.D. bolt lights. You won't find a cleaner license plate lighting option with a simpler installation. 9399: Each License Plate Illuminator has two L.E.D.'s. The white L.E.D. lights up the license plate and the rear-facing red L.E.D. can function as an auxiliary running light, turn signal, or brake light for added visibility. The 1/4" mounting stud makes it simple to bolt them on, wire them in, and ride on! 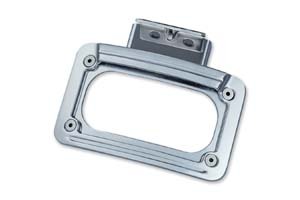 9168: This small chrome display bracket mounts cleanly in any location dictated by local or state regulations. Now you don't have to mess up a nice paint job or chrome surface with a government sticker. Universal fitment. Plate 3-1/2" x 3-1/2". 9162: Same as above but for Texas with dimensions: Plate 2-7/8" x 4". License Plate Bolts: Made in USA. 1" Diameter, 1/4" x 20 thread. Sold as pair. Eagle & Flag, Army, Army Star, Air Force, Marines, Navy, Special Forces, POW, Fire Department or Masonic. License Plate Frames: Fits most Standard License Plates. Made in USA. Made of 100% Aluminium. Will not Fade or Crack. Looks GREAT on your bike! Dimensions: Approx. 7 1/2 in. x 5 1/8 in.